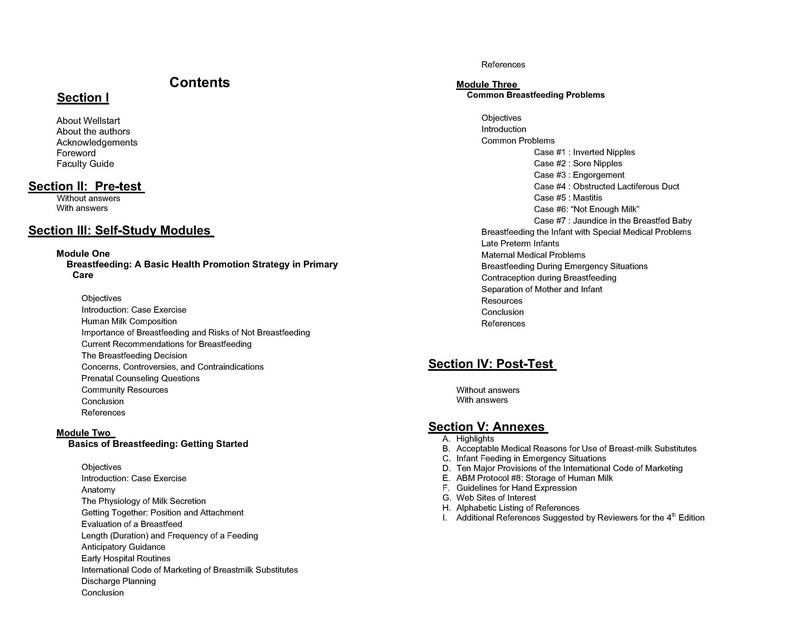 Table of Contents for Wellstart International Lactation Management Self-Study Module, 2014. Click to enlarge. Wellstart International has released it’s current evidenced-based Lactation Management Self-Study Modules (Level 1). 4th ed. Edited by Audrey J. Naylor & Ruth A. Wester (2014). This 151 page lactation training manual consists of 3 modules, a pre and post test to test knowledge gained, case studies for application of knowledge and a comprehensive annex full of useful resources such as an extensive list of lactation management and breastfeeding promotion websites, guidelines for topics like milk storage, guidelines for hand expression, Provisions of the International Code of Marketing of Breastmilk Substitutes and infant feeding in emergency situations (and more). The information is certainly not limited that that merely mentioned, there is more. Best yet, this training module is FREE! Not only is it a excellent training resource for lactation managers, but it can also be utilized as a study tool for those of us preparing for the IBCLC exam. 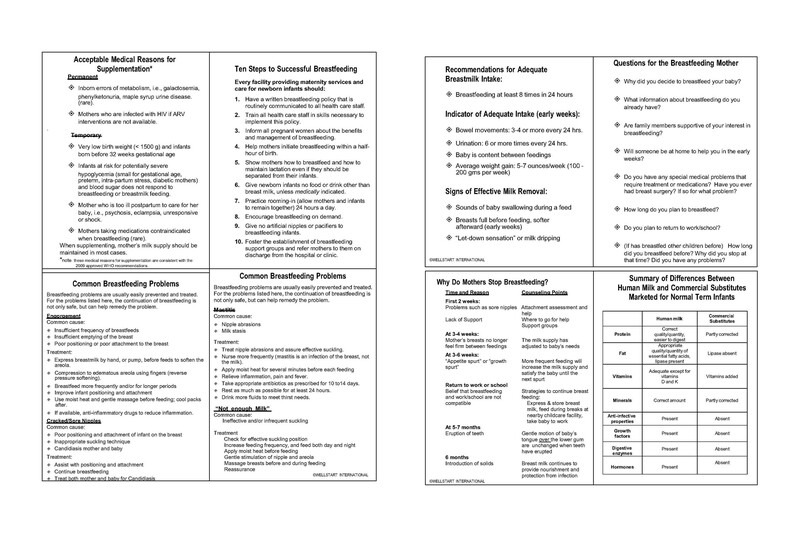 This Self-Study Module can be used by physicians, nurses and other maternity care staff to satisfy a portion of the 20 hour Baby Friendly® Hospital by Baby-Friendly USA, Inc. (BFUSA) training. Please refer to the Important Notice for U.S. Users of Wellstart International’s Lactation Management Self-Study Modules, Level 1, Fourth Edition 2013 for further details. Did I mention that the annex has little cheat sheets you can print off and take along with you on home or hospital visits? Very helpful! Here’s a quick peek, but download the actual module for higher quality formats. Click to Enlarge. If saving or printing, do so from original source for best quality. I am looking forward to taking this course. Is there a certificate of completion offered? As far as I know, it’s supposed to be a self-directed, self-paced study course that you do on your own for knowledge. To the best of my knowledge, I don’t believe they offer a certificate of completion, but you can contact Wellstart International directly and ask.